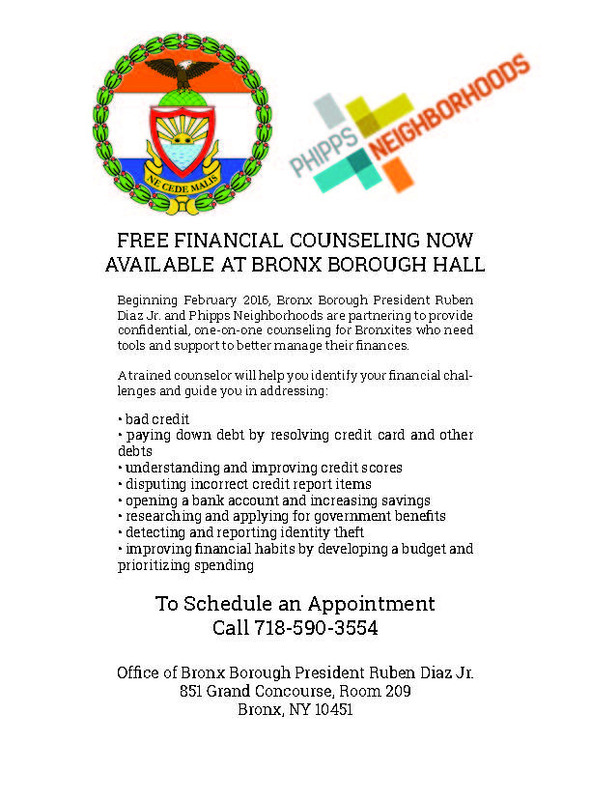 Bronx Borough President Ruben Diaz Jr. and Phipps Neighborhoods are partnering to provide confidential, one-on-one FREE financial counseling for Bronxites in the Borough President’s office (851 Grand Concourse, Room 209). A trained counselor will help you identify your financial challenges and guide you in addressing bad credit, paying down debt by resolving credit card and other debts, detecting and reporting identity theft and other concerns. To schedule an appointment, call (718) 590-3554 today. You must call for an appointment. No walk-ins. Bronx Borough President Ruben Diaz Jr. and Phipps Neighborhoods are partnering to provide confidential, one-on-one FREE financial counseling for Bronxites at 851 Grand Concourse, Room 209, Bronx NY 10451. Call for an appointment.